Your customers can easily look up product specifications, pricing information, and stock availability anytime their consider a purchase. And in turn, get rewarded with exclusive mobile coupons and app-only promotions. Consumer Apps are in. Do customers rather take a look or try out the product in person before buying? 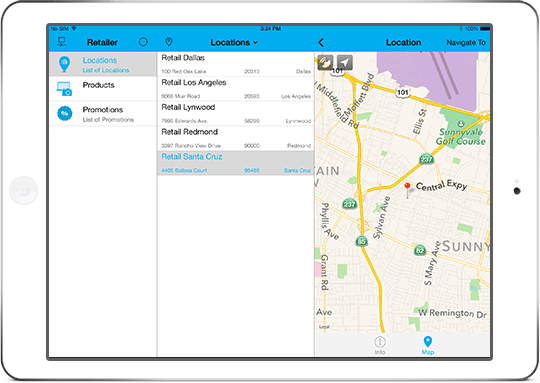 With your Consumer App, you can show them on a map where they can find you and navigate them turn-by-turn to your nearest retailer. Collaboration with vendors, contractors, distributors, volunteers, and other allies is crucial to any business. Facilitate cooperation via a handy application to keep each party up–to-date and to maintain focus on mutual goals. The key to a well-functioning public services is in the involvement of citizens with their municipalities. Give them an app that enables them toreport public issues and provides detailed insights into the elected officials decision making process. Your CRM system holds endless information. Pick ’n’ choose what’s important to your target audience and share it with your customers, partners or anyone else via an app made just for them. Add your own logos, icons, colors, or even change the entire UI. From looks to functionality, you can change anything to make it truly yours. Publish your new app on app stores (we can also help you with that) and notify your following about it. Whether on iOS, Android, or Windows, it’ll run seamlessly on any device. Let people browse through offerings, instantly find store locations, collect rewards, and get in touch with a single tap. A mobile app enables users effortlessly reach out and interact with your company. Browse through inventory with a breeze. Your customers can look up product specifications, pricing information, or stock availability anytime and order right from the app. Show people where they can find you and navigate them turn by turn to the nearest retailer. You can also offer exclusive discounts for checking in at your store locations. Turn first-time guests into regulars, highlighting specialty dishes or notifying them about the weekly menu updates. And when customers return for seconds, make sure they can check the availability of free tables and reserve their favorite spot in advance. Regular classes or a one-of-a-kind happening? Boost the attendance by extending your invitation via an app – including up-to-the-minute interactive schedule, showcase of past events or behind the scenes video sneak peeks. Take your entire loyalty program to the digital age and replace the old-fashioned customer cards with the app. Reward your regulars with special coupons and app-only promotions. The app’s social interface provides customers a forum to voice their experience with your business. Share product manuals, user guides or answer questions and inquiries to demonstrate the level of your customer care services. Collaboration is crucial. And a handy app can further facilitate your joint efforts with partners, vendors, contractors, distributors and your other business allies. A mobile application integrated with your CRM enables your partners to follow the order fulfillment process. Or the other way round – let suppliers inform you that your shipment has left their facilities and is already on its way. Let your vendors create cost estimates and deliver quotes straight to your CRM from the app. And when you pick a subcontractor, receive updates about the progress of the job they’re working on. 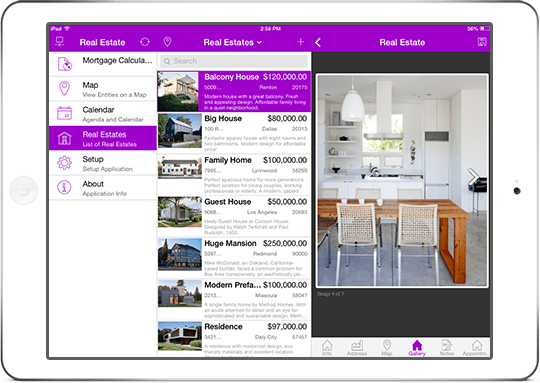 Instead of handing out flyers, brochures, or catalogs, that can amount to weight and being lost, pack them inside a mobile app for easy reference anywhere, anytime. After all, they are the ones that get your products to the end customers. Keep them updated with the latest pricing, sales kits, promotional materials and presentations. 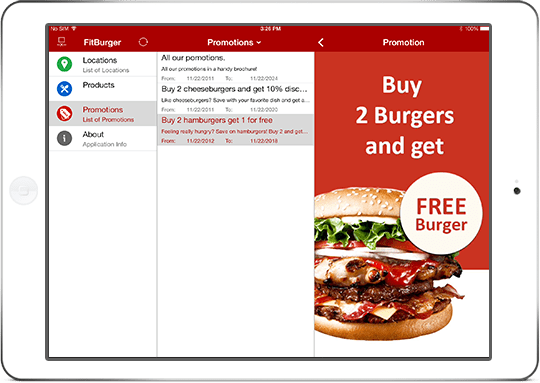 Or let your distributors use the app to explore sales strategies and directly order the stock they need. When working on mutual endeavors, exchange messages via the incorporated chat, as your projects advance. Instantly attach pictures, video, audio or even a link to particular record with just a tap. Promote the involvement of citizens in public matters. Governments, municipalities, local institutions and offices – all of them can bring people closer to voicing their opinions in a simple, practical way. With an app citizens can report defects that otherwise might take weeks to get repaired or even go unnoticed. Alerting the authorities about potholes or burnt out streetlights in a suburb neighborhood becomes a matter of a few taps on your phone’s screen. 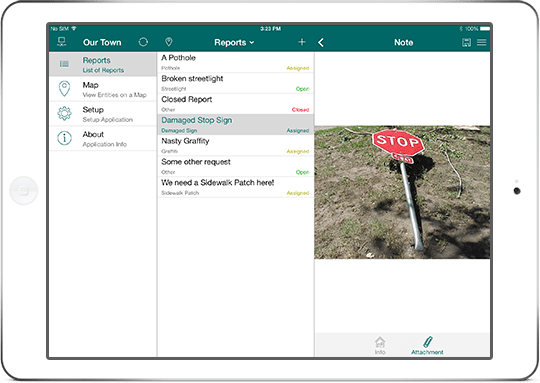 To emphasize a submitted issue, citizens can add multimedia attachments to their reports. Photos, videos or audio recordings can be taken directly from the app. And they can attach the GPS coordinates of the site as well. Have the reported cases been accepted or already resolved? How much will the repairs cost? What is the completion date estimate? Allow users to track the progress made on public matters – all the details accessible for every citizen to see. Municipalities can create questionnaire surveys and ask the residents directly what they think about civic matters that influence their everyday lives. The results will clearly state which way the public opinion sways. Keep tabs on what’s going on – from local events in culture and sports to volunteering opportunities and more – city halls can push notifications and direct the users’ attention to various events in the area. Set up in-app Q&As with city representatives for people to understand their decision-making. Share all the important announcements on a digital notice board. Or turn the app into another communication channel between the citizens themselves. The choice is yours.